Students held signs outside the White House to show their solidarity with groups they believe President-elect Donald Trump has insulted. Photo courtesy Michael Barsky. 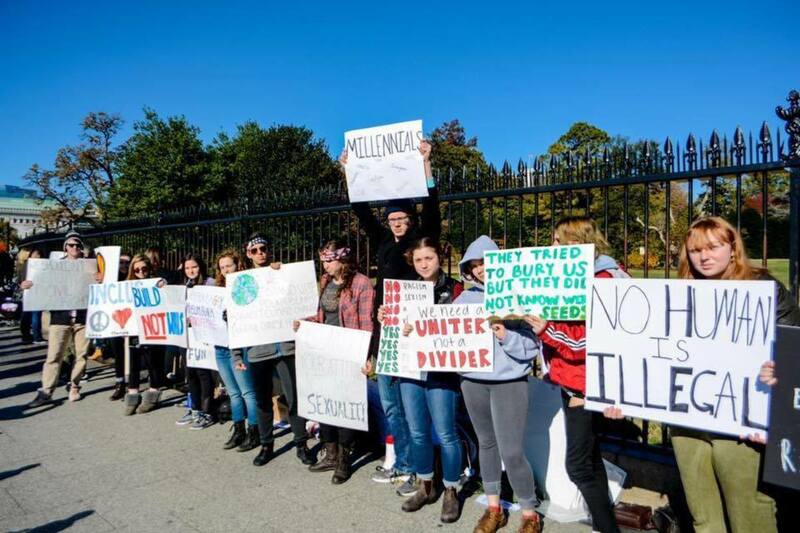 Approximately 30 Whitman students gathered outside the White House this Saturday to show solidarity with oppressed minorities. The protest was spurred by President-elect Donald Trump’s campaign comments and social policies—many of which the students said they find offensive. They also protested to protect the environment, senior Mariano Zamora added. Students displayed their opinions by sitting with signs including messages such as “Girls just want to have FUNdamental rights,” “Build bridges not walls,” and “We shouldn’t have to protest for civil rights.” They also handed out flyers, talked with pedestrians and walked around D.C. with posters. One of the event coordinators, senior Jessica Kline, believed the demonstration was necessary since many Whitman students disagree with Trump’s treatment of minorities. Kline organized the event via Facebook and advertised the week before the demonstration both verbally in school and by sharing the event with students on Facebook. Though Kline disagrees with Trump’s social policies, she emphasized that the events wasn’t designed to protest the election. The 30 students, mostly upperclassmen, attended the demonstration, along with students from Sidwell Friends School and Bethesda-Chevy-Chase High School. Kline noted that they were the only group in front of the White House protesting Trump, explaining most protest groups were in front of Trump Tower in New York, New York. Most students who attended believed the demonstration was successful. Barsky felt one interaction truly embodied the idea behind the demonstration. The teacher took their flyers and will be sharing them with her third-grade class when she gets home, Barsky said. “This event moved beyond just the White House, and will be going all the way to Portland and helping those kids feel safe,” Barsky said. Kline plans on organizing more demonstrations if Trump continues what many view as discrimination against minorities that began during his campaign throughout his presidency.